Death is one of the most significant events of any life. Like many people, I was initially skeptical that astrological indications are provided at the time of death. When I started intensively studying astrology, but before studying traditional astrology, I would carefully examine the timing of celebrity deaths. I pored over the transits for some cogent sign of the end. I was surprised to find that exact symbolic transits were rather rare. Occasionally, there would be a particularly telling transit, but it would often involve the Moon, which would make the same transit each month. Of course in those days, I was fixated on transits and progressions. I did not understand planetary periods and time lords. At that time, I didn’t understand the natal chart much beyond “personality”. Now I understand that predictive indications must reflect natal indications of death. Everyone has various indications of death in their own charts, and everyone dies eventually. For transits and other predictive techniques to make sense they must reflect natal indications of death. Those natal indications must also be reinforced through numerous layers of similar symbolic activation. Activation gives transits “meaning”. Getting into traditional astrology, I deeply researched the techniques given by Robert Zoller in his DMA course. Zoller’s approach to the astrology of death largely revolved around the techniques of Bonatti (13th century CE). It also included elaborations of a technique involving primary directions made popular by Ptolemy (2nd century CE). In my own research, I went from doubt, to enthusiasm, to renewed doubt, about such techniques. From there I researched Bonatti’s sources. His sources were primarily Perso-Arabic astrologers of the last few centuries of the first millennium of the common era. I started to get a sense of a greater diversity of opinion existing in the older texts as compared with the late Middle Ages where things became more homogenized. Finally, reaching back into the earliest surviving strata of horoscopic astrology, Hellenistic astrology, my suspicions were confirmed. It became clear that there was a diverse wealth of material on death in Hellenistic astrology. This material still needs exploration, testing, refinement, and synthesis. In this series, I have, so far, worked in broad and general strokes, looking at fundamental symbols of death in the chart. You will notice that I’ve ignored some of the more particular special techniques for longevity. I will continue such a trend with this article on Elizabeth Taylor (analyzed by request of a reader). The approach follows along similar lines of analysis as my prior articles on the subject. Initially, I looked at the death of Whitney Houston, with an additional focal analysis of primary directions. I also looked at the shocking death of Marvin Gaye at the hands of his own father on the day of his solar return. 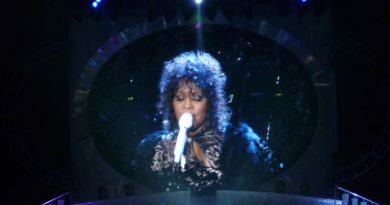 Additionally, I examined the death of Donna Summer, a death by cancer at age 63, which included a look at zodiacal releasing. 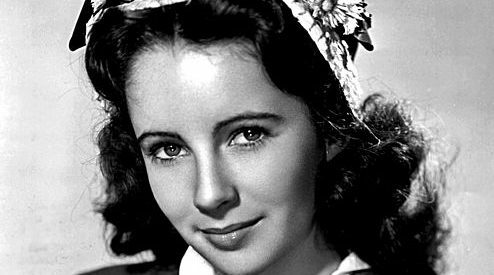 Now we turn to Elizabeth Taylor who lived to 79 years of age, dying of congestive heart failure. Elizabeth Taylor was born on February 27th, 1932 at 2:30 am in London, England (birth data rated AA for accuracy). Her chart is pictured below with twelfth-part positions and then again with a few choice lots. For those who have followed my series on the professional significator, you will notice that Venus is the clear choice. She is is strongly advancing conjunct an angle (adhering to the IC), in a succedent house, rules the bound of the Ascendant, and closely aspects the Ascendant. Venus also rules the sign of the MC, and has triplicity in the 10th. Additionally, she is the ruler of the twelfth-parts of the Ascendant, Sun, Moon, Fortune, Mercury, and Venus. That Venus is scrutinized by Jupiter adds an additional sense of opportunity, elevation, and fortune to her significations. Venus, goddess of love and beauty, pertains to a profession relating to aesthetics, the arts, and/or entertainment. As with the death of Donna Summer, Taylor’s death was not a sudden dramatic affair. It was a relatively peaceful death by congestive heart failure at the advanced age of 79. As we look at her death, it will be important to first identify some of the more difficult areas of the chart, particularly as they relate to health and the body. The Ascendant and the Lights, particularly the sect light, are important in terms of health. Also, Valens noted some important points in Book II, Ch. 41 of his anthology that become relevant for the matter of the type of death. These include the prenatal syzygy (i.e. the position of the new or full moon preceding the birth), the 7th place, the 8th place, the 8th place from Fortune, and Fortune itself. The 4th place is also noted as significant with regards to death by Valens and many other authors. Additionally, there is the Hellenistic Lot of Death, which is taken by day or night, as the distance from the Moon to the start of the 8th sign, projected from Saturn. In terms of the planets, Saturn is the one that naturally signifies death. Let’s look at these factors in Taylor’s chart. The sect light, the Moon, is in the 12th place, Scorpio, in her fall, squared by Saturn in Aquarius, and ruled by Mars. This is among the more difficult configurations in the chart as the 12th place is also the Place of Affliction (Injury) and the 8th from Fortune. Additionally, the Moon rules the 8th house, Cancer, and the Moon’s twelfth-part is in the 6th house of illness. The Sun, symbolic of vitality, is with Mars, in Pisces, the 4th house. Mars is also with Mercury, the ruler of the prenatal syzygy and Lot of Death. 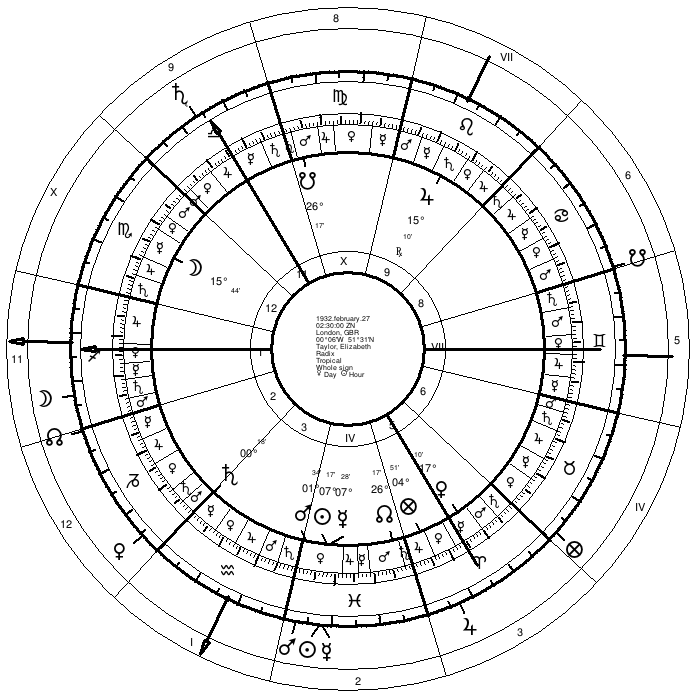 The prenatal syzygy of the chart is at 2 Virgo, opposed by Mars within a degree. Therefore, while Mars is in sect, it is still an important planet to watch in terms of death and threats to the health. Jupiter rules the Ascendant and in Leo is in opposition to Saturn in Aquarius in the chart. Jupiter is the lord of the Ascendant (self/body) and Saturn is the out of sect malefic (malefic with least regard for the self). Their relationship is reinforced by the conjunction of the twelfth-parts of both planets in Aquarius. Virgo is of interest because it is the place of death by lot (14 Virgo). It is also the sign of the prenatal syzygy (the Full Moon at 2 Virgo that preceded Taylor’s birth). Mercury rules the sign but opposes it, and is cazimi the Sun. Liz Taylor died at age 79, in her 80th year, so we are particularly interested in the activation of planets by planetary years which pertain to 79 or 80. Looking at 79, some activated planetary combinations include Saturn-Sun (30+30+19), Mars-Sun (15+15+15+15+19), Saturn-Mars-Sun (30+15+15+19), Mercury-Sun (20+20+20+19), and Jupiter-Sun (12+12+12+12+12+19). The Sun and Saturn don’t aspect each other, nor rule each other, so that activation is less signification. It is similar with Saturn and Mars. Therefore, the Mars-Sun activation is particularly significant for our purposes. Mars and the Sun are together in the chart and relevant for health and death. Looking at 80, some activated planetary combinations include Mercury (20+20+20+20), Mars-Moon (15+15+25+25), Saturn-Moon (30+25+25), Saturn-Mercury (30+30+20), Mars-Mercury (15+15+15+15+20), Venus (8*10), and so forth. There are a lot of ways that combinations of planetary years fit into 80. However, for our purposes we are most concerned about combinations that involve natal configurations (rulership or aspect). The Mars-Moon activation is significant of the Moon in the 12th in Scorpio. The Mars-Mercury one is significant due to the conjunction of Mars and Mercury in the 4th house. The Moon doesn’t have a strong relationship with Saturn. Neither does Mercury. In conclusion, for the year of death we are interested in the activation of Mars as it relates to the Sun, Moon, and Mercury. Releasing from Fortune was noted by Valens as significant for matters of health. As mentioned near the end of last article, the emphasis is on the first two levels. The lord of the sign of level 1 transmits to the lord of the sign of level 2. In this case, what we have is the Sun transmitting to Mars. This is interesting from the standpoint of a luminary, showing power and vitality, passing off to a malefic, showing harm. It is also interesting from the standpoint of activating the Sun-Mars conjunction in the chart. You’ll recall that the Sun-Mars configuration is one of the configurations of harm in the natal chart that was highlighted by planetary years. We then see Mars transmit to the Moon (Aries to Cancer). You’ll recall that the Mars-ruled Moon is a key factor pertaining to death in the chart and was highlighted by the planetary years. Zeroing in on the day of death we find that occurred just a couple days after the switch to L3 Cancer, so L4 was still in Cancer as well. The Moon transmits to itself (Cancer to Cancer). That Cancer is highlighted in the shorter periods around the death is very significant. Cancer is the place of death (8th house) in the chart, and Cancer’s ruler, the Moon, is in the 8th place from Fortune. As we’ll see when we get to transits, the Moon-Mars relationship also shows up strongly at the time of death. The death occurred on a lunar return in Scorpio with the Moon in partile aspect to transiting Mars. In conclusion, the zodiacal releasing of the second level (December 2010 to February 2012) highlighted a sense of vitality and heart (the Sun rules the heart) undergoing turmoil or violence (Mars). It was an activation of the natal Sun-Mars conjunction, also highlighted by planetary years. The third level, Cancer, started on March 21st, 2011, and activated the natal Moon-Mars relationship. Mars transmits to the Moon and activates two houses with particular relevance for death (the 8th, Cancer, and the 8th from Fortune, Scorpio). 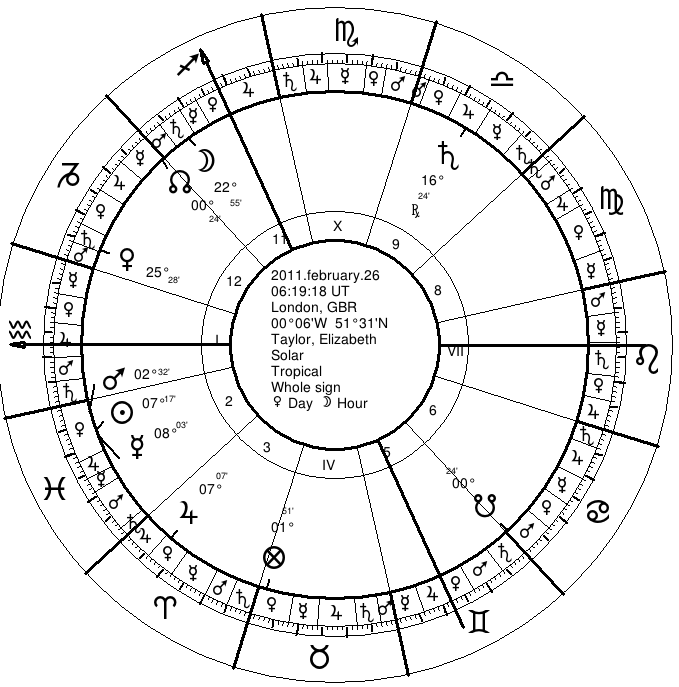 The fourth level (March 21-25) again put the emphasis squarely on the Moon, with the death occurring on a lunar return. Distributors are important time lords that one finds by directing certain important points through the bounds. The dis­trib­u­tor is typ­i­cally the bound lord of the directed Ascen­dant (using zodi­a­cal semi-arc non-latitudinal ptolemaic-key pri­mary direc­tions). However, some Per­sian astrologers used the sect light rather than the Ascen­dant. This parallels the use of the sect light as an alter­na­tive to the Ascen­dant in many Hel­lenis­tic tech­niques, such as for profectional lord of the year. Planets apply­ing an aspect to the directed point (Ascendant or sect light) can share in the distribution as co-distributors. Presumably this aspect would have to be within 3 degrees, as that was the defin­i­tive range for appli­ca­tions in Hel­lenis­tic astrol­ogy. In later traditional astrology, there was something of an obses­sion with direct hits by pri­mary direc­tion. This contrasts with the traditional emphasis on the distributor as time lord. After about the 15th century CE there also was an outgrowth of different ways of calculating primary directions. 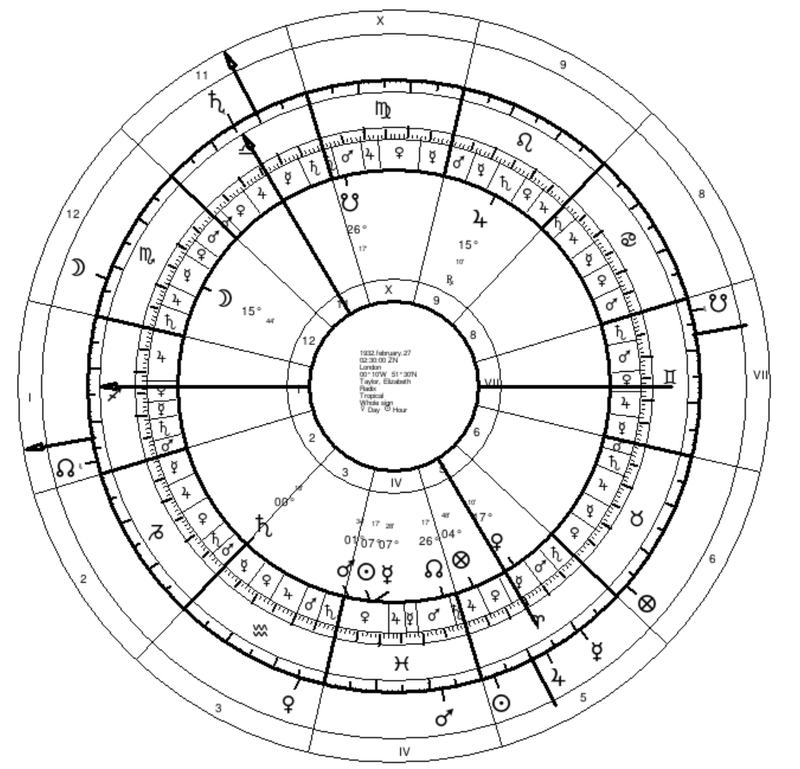 However, the traditional manner of calculating them, in the zodiac using semi-arcs without latitude and by the rate of the Ptolemaic key, was the standard before then. I touch on some of these issues in my intro­duc­tory post on pri­mary direc­tions (and there’s a post on software cal­cu­la­tion). Taylor died on March 23, 2011. The table of distributors are below. The distributor of the Ascendant was Jupiter, while that of the sect light (the Moon) was Mars. You may recall that for Donna Summer also, at the time of death the distributor of the sect light, the Moon, was Mars. Now let’s look to see if there are any aspectual co-rulers of the distribution. At the time of death 5° Aries directed over the Ascendant. There was not an aspectual co-distributor for the directed Ascendant. However, 28° Capricorn passed over the Moon. Saturn at 1 Aquarius, was applying within 3 degrees. Saturn may be thought of as a co-distributor of the Moon but the aspect is out of sign, so I don’t strongly consider it. In conclusion, the sect light had Mars as distributor. In this we see the important activation of the Moon-Mars relationship. The Ascendant had directed into a new sign (Aries), one ruled by Mars, but it had Jupiter as the distributor. It was noted that there is a Jupiter-Saturn relationship of interest in the natal chart. Jupiter, lord of the Ascendant, figures prominently in some significations at the time of death also, as we’ll see. The final annual profection is very interesting. She turned 79 less than a month prior to her death. At age 79, the profection is to the 8th house (72=1st, 73=2nd, 74=3rd, 75=4th, 76=5th, 77=6th, 78=7th, 79=8th). The 8th house, which is also known as the Place of Death, is the sign Cancer in her chart, ruled by the Moon. Therefore, the Moon is the lord of the year. This is a particularly important planet to look at in regards to the most significant events of the year. You’ll recall that the Moon, herself, is located in Scorpio, the 12th house, one of the most difficult houses of the chart. Additionally, in her chart Scorpio is the Place of Affliction and Injury (by lot) and the 8th Place from Fortune (another place of death). We had established that she is one of the key significators of death in the natal chart. 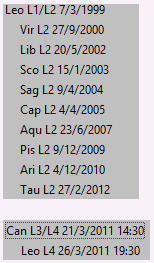 In monthly profections, the first month after the solar return (i.e. “birthday”) goes to the sign of the annual profection. As the death occurred less than a month after the solar return, the monthly profection matches the annual profection. Again, it is Cancer. Therefore, the Moon was lord of the year and the month. This is strong reinforcement of the highlighting of the 8th house (Cancer) and the Moon in Scorpio by planetary years, zodiacal releasing, and the primary direction of the Moon. 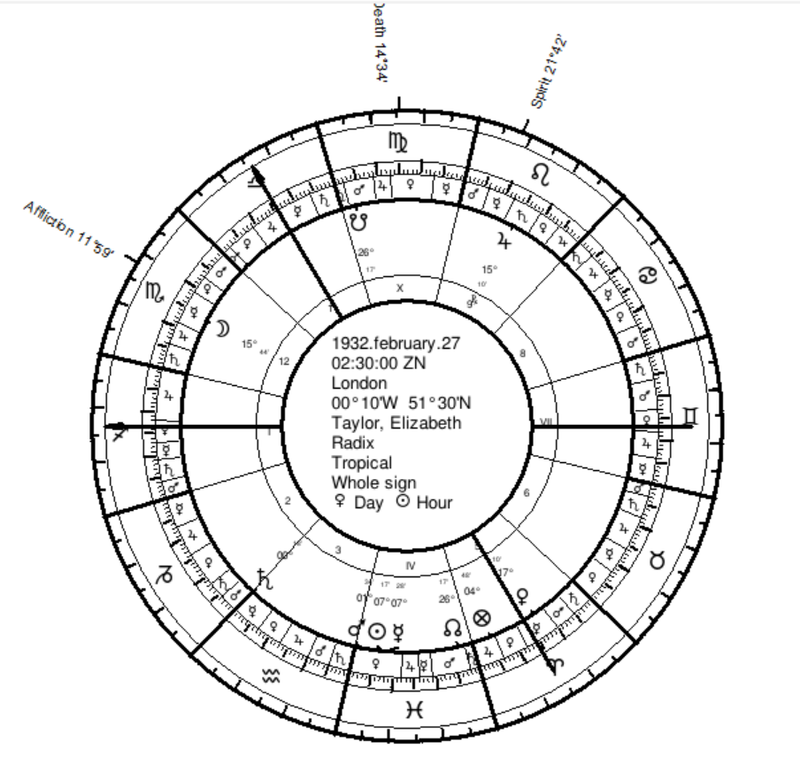 For planetary days, one starts with the lord of the year and proceeds through the planets in the order in which they appear in the chart (via zodiacal order). The Moon gets 70 5/6 planetary days. 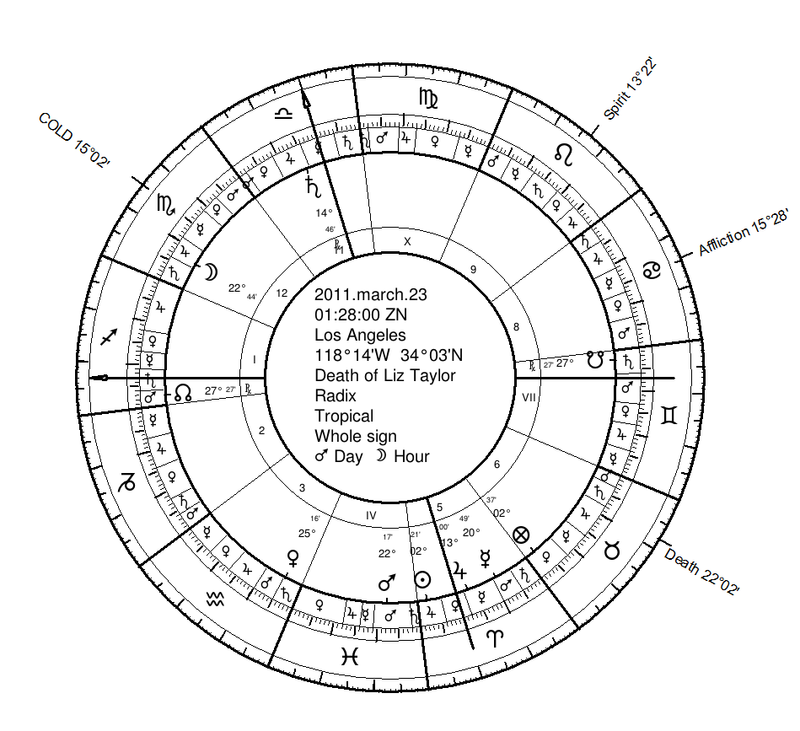 As the death occurred less than a month after the solar return, the Moon was the ruler of days at the time of Taylor’s death. You will also recall above from the discussion of zodiacal releasing that highlighted Cancer for L3 and L4. The Moon became the most important time lord pertaining to physical health matters (by L3 and L4) just a couple days before Taylor died. Clearly, in terms of profections, day lords, and releasing for health, the spotlight is on the Moon at the time of Taylor’s death. I dis­cussed Valens-Style pro­fec­tions in a past article. As noted, one can profect any point in the chart, but the pro­fec­tion of the sect light was particularly common, while the Moon was significant for mat­ters of the body. In Elizabeth Taylor’s chart the Moon is the sect light. In Taylor’s case, the Moon pro­fects to Gemini, the 7th House, which is empty, so it is a case of the Moon trans­mit­ting to Mercury. The 7th itself carries some significance for matters of death (place of setting). Mercury is in the 4th, which also carries such significations (place of anti-culmination, endings, and the earth). Mercury is cazimi the Sun and is with Mars. While overall, the emphasis has been on the Moon, we see that Mercury may also have some special significance in terms of matters of the body. Mercury rules the Lot of Death and the prenatal syzygy, both of which are in Virgo. It should be noted that all the profections are to the 8th place from their position. As the Moon is in the 8th from Fortune, Fortune itself transmits to the Moon. This additional emphasis on the Moon is significant as Fortune’s profections were used to judge overall material circumstance. Liz Taylor’s final solar return is shown below. We had determined that the main planet to watch is the Moon and that Mercury may be of some lesser importance. Also, because of the distribution, we may want to take a look at the malefics and Jupiter. The Moon in the return is in Sagittarius, which is the 1st house of the natal chart, pertaining to the body and self. Its position in the 1st is particularly significant for the body, as the Moon herself naturally signifies the body (repeat signification). The Moon is in the house of Jupiter, bound of Saturn. She is separating from Saturn and applying to Mars. Therefore, the Moon moves from malefic to malefic. Jupiter is the lord of the natal Ascendant, bound lord of the directed Ascendant, and ruler of the solar return Moon. Therefore, it’s a planet to watch. Return Jupiter is opposing return Saturn, echoing the natal Jupiter-Saturn opposition. This was one of the natal factors noted as particularly significant for death. Solar return Saturn is on the natal Midheaven and strongly opposes natal Venus (sect benefic). We’ll see that all of these factors are important at the time of death. The time of death was given in a news report as 1:28 am on March 23, 2011, in Los Angeles, California. The chart of the time of death is below. Rarely are the daily transits of lots examined. However, with the exact time of death, we can actually examine the exact timing of transiting lots, confirming their importance. Therefore, there are some choice lots included on the chart of the transits at time of death. We are fortunate to have the exact time of death, as there are many striking features about this specific time. For one, it is 22° Sagittarius rising. Sagittarius is Taylor’s rising sign. More significantly, 22° Sagittarius is also the very degree held by the Moon at the solar return. Therefore, at the moment of death, the degree held by the solar return Moon was rising. Recall the natal and predictive emphasis on the Moon for matters of death. The solar return chart is shown again below. Recall that the natal Moon is at 15° Scorpio. At the time of death, the transiting Moon was at 22° Scorpio. In other words, Taylor died on her lunar return. Actually, her death was on the very day of her lunar return as astrological days are sunrise to sunrise. Additionally, the transiting Moon at 22° Scorpio was in partile aspect to its transiting ruler Mars at 22° Pisces. Therefore, the natal Moon-Mars relationship is popping at the time of death also. In fact, the death even occurs on a Mars day and at a Moon hour (see article on planetary days and hours). As noted, an astrological day starts at sunrise, which is why it’s still a Mars day (Tuesday). Transiting Mars is at 22° Pisces, square to the solar return Moon and the transiting Ascendant to the degree (both were at 22° Sagittarius). Lots, like the Ascendant, make a complete revolution around the zodiac each day, so their locations in transit are rather ephemeral. However, like the Ascendant their transits can pertain to timing very specific moments. The Lot of Boldness (noted as “COLD” on the chart) pertains to actions without feeling. At the moment of death it transited right at the degree of Taylor’s natal Moon (15° Scorpio). The Lot of Death was transiting at 22 Taurus, exactly opposite the transiting Moon! Therefore, even when it comes to the transiting Lot of Death we see a spotlight on the Moon and its importance for signifying death. There was a strongly applying Jupiter-Saturn opposition by transit (within 2 degrees) at the time of death. 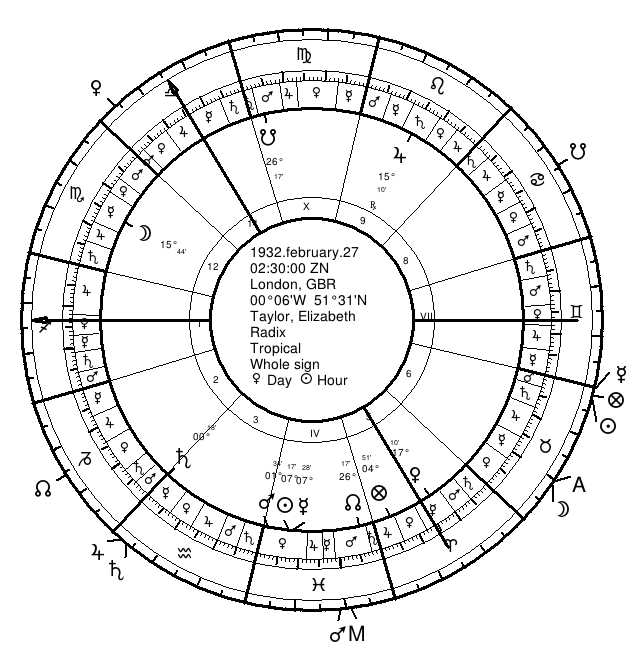 Saturn is culminating at 14° Libra (the natal MC degree) opposed to Jupiter anti-culminating at 13° Aries. In addition to transiting Jupiter, the transiting Sun and Mercury are also in Aries, in opposition to transiting Saturn. Saturn, the natural significator of death, is the most strongly advancing planet at the time of death. While sudden deaths are often more dramatic in their symbolism, we can learn a lot about astrology from examining the time of any death. As in all types of natal timing, the work starts with a thorough understanding of the relevant symbolism in the natal chart. We then proceed to look at the big period activation patterns. From there we can employ annual techniques to assess the most important themes. Finally, we can examine smaller time period lords and transits to examine timing. The timing of Taylor’s death is fascinating particularly for its emphasis on the Moon in Scorpio, given the Moon’s symbolism for death and illness. The Moon is the ruler of the 8th, the ruler of the Lot of Affliction, and the occupant of the 8th from Fortune (Scorpio). The Moon-Mars relationship was highlighted for the period by planetary years, the transmission of Mars to the Moon by zodiacal releasing (Aries L2 to Cancer L3), and Mars as distributor of the Moon by primary directions. Turning to annual methods we found the annual profection and monthly profection to Cancer (8th house) with the Moon as lord of the year and month. The solar return saw the Moon transiting in the natal 1st house and applying to Mars which had returned to its own natal position. Elizabeth Taylor died on her lunar return in Scorpio, with the Moon as the lord of the year and month by annual profections, ruler of days, and ruler of the L3 and L4 of zodiacal releasing. She died during the lunar hour of a Mars day with the exact degree of her prior solar return Moon rising and when the transiting Lot of Death opposed the transiting Moon. There were some other factors that were relevant as well but these themes surrounding the 12th house Moon in Scorpio are by far the most mind-blowing. The article was significantly edited for clarity. Passages pertaining to the Lot of Death and an overall conclusion were added.